TankZone is provided for tank enthusiasts by tank enthusiasts. We only supply tanks that we run ourselves. We are currently converting this 1:16 Porsche-turreted King Tiger tank with the Tamiya MF-1 multi-function pack to give it the same functions as the Tiger 1 and M4 Sherman. 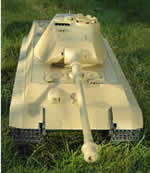 This 1:16 scale King Tiger is already in running order with the optional rotation unit installed. Much of the details are still missing. The chasis and running gear has been sprayed dark green and the superstructure a coat of factory-fresh dark yellow. It will eventually be spray-camouflaged to depict an early model deployed during the aftermath of D-Day. Watch this space. Bookmark us now! Armament: One 88mm main gun, one 7.92 MG34 machine-gun co-axial with the main gun, one 7.92 MG34 machine-gun in hull front, one 7.92 MG324 anti-aircraft machine-gun on turret roof. Performance: Road s peed: 38km/h, Cross-country: 17km/h, Range: 110km, Vertical obstacle: 0.85m, Trench: 2.5m, Fording depth: 1.6m, Gradient:35%. Powerplant: Maybach HL230 P30 V12 water-cooled inline petrol engine generating 600bhp at 3,000rpm. Dimension: Length: 7.25m, Width: 4.27m, height 3.27m. Brief History In service with the German Army from 1944 to 1945.